The works by the late Minnie Pwerle captivated the art world. 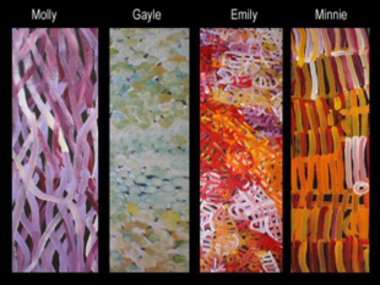 Together, Minnie, Emily, Molly and Gayle create the magic that is in the forefront of contemporary art today – works from the artists of Utopia, Central Australia. 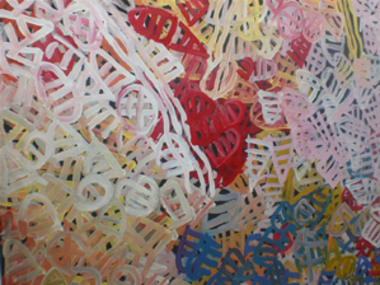 In January 2006 an exhibition of the four Pwerle sisters works was exhibited together for the first time. The oldest sister, Minnie Pwerle was already a prominent artists, known in Australia and overseas for her bold, gestural style and wild palette of colour. But for the other sisters—Emily, Molly and Gayle, it was their first exhibition and highlighted the immense artistic talents of all four sisters. 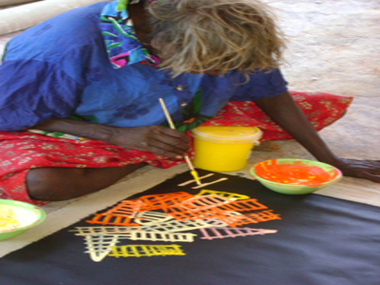 In the country of Atnwengerrp approximately 280 kms north east of Alice Springs the sisters live and work, painting their Dreaming associated with this country. The desert landscape and spiritual ancestors that walked across the empty lands created all that is and provide a never ceasing source of inspiration for their works. These abstract works require a relearning of the way works by Indigenous people are viewed—a refocus on—the artist. There is a sense of complexity as we a forced to rethink what we are viewing – no concentric circles, u-shapes or digging sticks adorn these works. We are immersed in vibrant colours, thick fluid lines and overlays that create an extrordinary visual depth and emotional intensity that defies explanation. Is there also a sense of liberation in the unknown, to have the opportunity to appreciate these works for the aesthetics alone?